I am sorry for vanishing all of a sudden. I'm preoccupied with too many things and my new job, adjusting to the new environment etc and etc so many things to catch and steady myself. Meanwhile I completely forgot that I was a blogger with so many friends who encourage me to keep going. Now I would like to make up for the lost time and also would like to thank my friends Hari Chandana, Kanthi garu and my precious buddies for your time to time cheer and motivation. 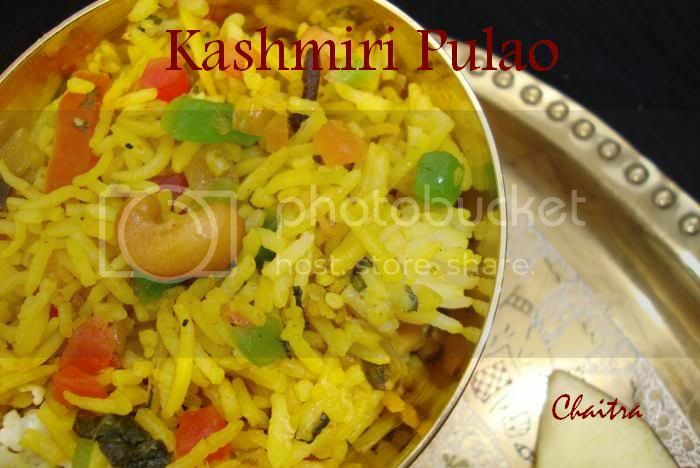 I am posting Kashmiri Pulao just to ring a bell to all the dearies that I am back with a bang. Promise to post from now on regularly. Do shower your support on me and my blog. Apple - 1 finely sliced. 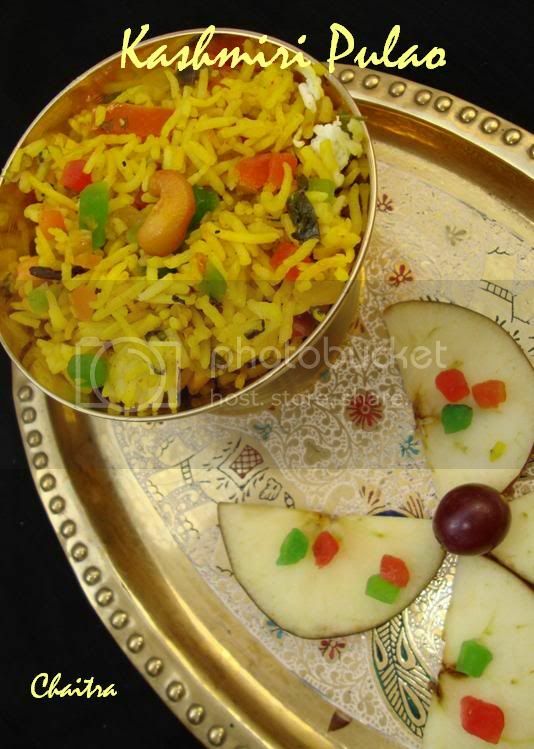 Cook Rice with Saffron, Sugar and Salt. Add one tsp of Oil so that the grains do not stick. Keep it aside. Boil the vegetables until they soften adding a pinch of salt. Remove and keep it aside. Take a frying pan. Add ghee and fry cashews, almonds and raisins until golden brown in colour. To the same pan. Add cooked Rice and boiled vegetables. Adjust salt and a Pinch of sugar. Mix all the ingredients well. Off the flame. Finally add the cut fruits and tutti fruity. Garnish it accordingly and Serve.